This entry was posted on Wednesday, December 30th, 2015 at 1:36 AM	and is filed under Modern(ish). You can follow any responses to this entry through the RSS 2.0 feed. You can skip to the end and leave a response. Pinging is currently not allowed. What was it about the geology, or maybe the climate, that meant that the logs hadn’t rotted? Or was it perhaps the timber? What an amazing find! To be able to see this without it having rotted… Thanks for sharing this. Eastern cedar is very rot resistant. When buried like this was and not exposed to air, the resistance would be even more. Having been buried in this way for 150 years probably resulted in its remarkable preservation. Can I take it, Jim, that in this case the layer of stones would have protected the logs from frost damage? Or are they frost-resistant anyway? dearieme, It’s almost three years since you asked your question, but I can’t stand to see it unanswered. 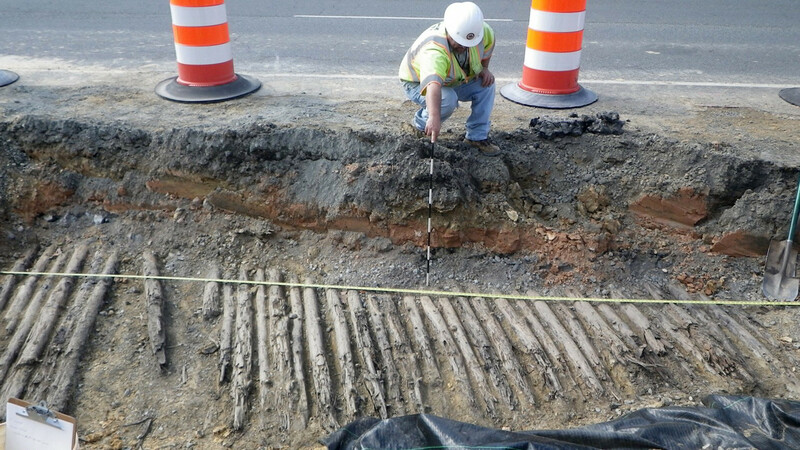 It appears from the picture heading the article that the log layer is probably below the frost line and would not have been affected by frost heave.